Katherine Mortenhoe lives in a near future very similar to the present day. Only in her time, dying from anything but old age is unheard of; death has been cured. So when Katherine is diagnosed with a terminal brain disease brought on by an inability to process an ever increasing volume of sensory input, she immediately becomes a celebrity to the “pain-starved public.” But Katherine rejects her tragic role: She will not agree to be the star of a Human Destiny TV show, her last days will not be documented or broadcast. What she doesn’t realize is that from the moment of diagnosis she’s been watched, not only by television producers but by a new kind of program host, a man with a camera behind his unsleeping eyes. Like Margaret Atwood’s MaddAddam trilogy, Kazuo Ishiguro’s Never Let Me Go, and the television series Black Mirror, The Continuous Katherine Mortenhoe is a thrilling psychological drama that is as wise about human nature as it is about the nature of technology. David Guy Compton was born in London in 1930. It quickly became apparent that his parents—theater people soon to separate—were not the child-rearing sort, and they donated him to his elderly Scottish maternal grandmother, recently widowed and returned to England from colonial India. Fortunately she was well off and happy to raise him accordingly. Stagestruck in his teens and determined to become a playwright—after school and eighteen wretched months of statutory National Service in the British army—Compton followed his parents into the theater, finding work as an assistant stage manager with a local repertory company. A year later, now twenty-two years old, he had a baby daughter with the wife of the director and was unsurprisingly jobless. The sixty-four years since then have been classic writer’s biography material: various unsuitable employments—postman, window dresser, bank guard, dockyard worker—to support family life and constant literary activity. Compton’s first sales were of radio plays for the BBC and in translation abroad. He also got editorial work, particularly for Reader’s Digest Condensed Books. Short stories and then novels followed, most significantly in a genre that—being no scientist—he likes to call speculative fiction, and in 1968 his critically acclaimed novel Synthajoy introduced his work to American readers. In the years that followed a dozen or so well-received novels appeared—among them Ascendancies, Nomansland, and Justice City—and in 2007 the Science Fiction Writers of America granted him author emeritus status. 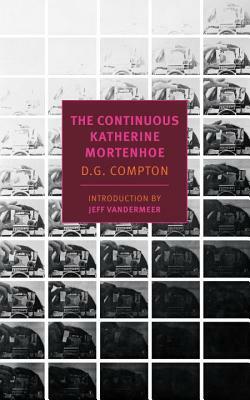 His 1974 novel, The Continuous Katherine Mortenhoe was filmed as Death Watch by the French director Bertrand Tavernier in 1980. Compton lives in the United States now, in Maine, where he is active in the assisted suicide movement and currently does freelance condensation work for Reader’s Digest in Australia. Jeff VanderMeer is the author, most recently, of the best-selling Southern Reach trilogy (Annihilation, Authority, and Acceptance), which won the Shirley Jackson Award. His nonfiction has appeared in many publications, including The New York Times, The Guardian, The Washington Post, and the Los Angeles Times. He lives in Tallahassee, Florida, with his wife, the editor Ann VanderMeer. He was recently named the 2016–2017 Trias Writer-in-Residence for Hobart and William Smith Colleges.